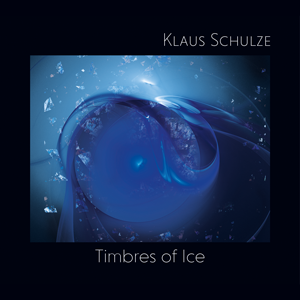 „Timbres Of Ice“is another raised treasure from the Klaus Schulze cosmos! Re-Issue of the albums, which was part of the strictly limited and long exhausted 2002 5CD boxsets „Contemporary Works II”. Finally, the last disc from the CONTEMPORARY WORKS series gets a proper rerelease – TIMBRES OF ICE. So another gap was closed for all those fans who did not catch one of the limited boxsets. But how did a second CONTEMPORARY WORK set come about at all? Well, by working on CONTEMPORARY WORKS I Klaus pretty much liked working with young, new colleagues, so he asked his friends from Solar Moon, if they knew more talented musicians, who would possibly fit in this musical concept. Tom Dams later admitted that it was of course an honor that Klaus put so much trust in their judgement, but it was also a big responsibility, because “you can not throw any musical colleague into the KS cage”, for it has not only to harmonize musically, but also humanly. Tom is therefore a bit proud having a good hand in this matter. There was not a single artist that Klaus would not have liked very much. Of course, the guests were equally fond of meeting the maestro himself, and as he invariably encouraged them to “just play what the music told them,” the new recordings spawned a lot of creativity and fun. The production process was so intense and fruitful that in June 2002 Klaus sent not less than 12 CD-Rs to his publisher with the mission to compile another box set – the CONTEMPORARY WORKS II. Now, some will say, if there were twelve CD-Rs full of music, why did the CW II only become a 5-CD box? Well, there are several reasons for this. First, it is a 6-CD box really, because the first 333 customers of the CW II got a bonus CD called THANK YOU. In addition, there were duplicate tracks, or multiple versions of the same track, so they only picked the best version. Other pieces from that 12 CD-Rs became bonus tracks on one of the back catalogue rereleases. Nevertheless, there are still some unreleased tracks waiting to see the light of day, or to please the fan’s ears. TIMBRES OF ICE begins with the expressive solo acoustic guitar of Michael “Mickes” Lücker on The Lonely Dead Of Midnight, until Klaus’ harmonies uplift it with sublime depth. Then Tobias Becker’s oboe adopts this melancholic melody – a wonderful, quiet piece; one of the few out of the CW II box without any rhythm. The distorted vocals at the beginning of the second piece They Shut Him Out Of Paradise is the voice of Audrey Motaung. As so often with Klaus it is not about the words, but the specific sound they create. This applies also for Thomas Kagermann, who contributed his skillful improvisations of violin, flute and vocals all along the piece. This is a typical, relaxed Klaus Schulze epic. The last piece Die Prophezeiung Erfüllt Sich is dominated by a sampled reciting voice, as if someone was reading a text. You realize that it’s German, but you can not really understand it. Again, the words are unimportant, it is about the tonal effect, as well as the monks sacred chants at the beginning of the piece. Btw, it’s the only track in the CW II box with a German title. TIMBRES OF ICE – the title disguises the inner warmth that can be heard and felt in every note of this wonderful music. A warmth in sound and in the interplay of the musicians, but also a warmth surrounding and pervading the listener. This is music to relax, to enjoy and to dream – Klaus Schulze at his best.